We work with the best people to produce the best titles. Ann Glamuzina is a former lawyer who now writes full-time. Her debut novel, Rich Man Road, is based partly on the real-life story of her Croatian family, and spent several weeks on the NZ Fiction Bestseller List. Ann is a co-author of The Bitter Sweet Philosophies and is currently working on her second novel, Little Swallow. She lives in Auckland. Karen Breen is the author of Sleep Sister and co-authored The Bitter Sweet Philosophies. She is a former journalist, television producer/director and documentary maker. Born and educated in Auckland, she lived for many years in London where she made programmes for: Channel 4, The BBC, Sky and Channel 5. She is currently working on her second novel. Stephen Leaton is the author of Vivienne’s Blog. His second novel, Confessions of an Ape (The Several Minds of Richard) and an anthology of short stories and poetry, Disturbing Thoughts, are both due to be released next year. Leaton is also a co-writer of The Bitter Sweet Philosophies. A lawyer with some thirty years’ experience, he has published many articles in newspapers and magazines and holds various legal and educational degrees and professional qualifications, as well as a PhD in Creative Writing. His family consists of his wife, two children and two dogs - three of which are also lawyers. Tim Heath is an MC at Poetry Live and has won a number of major Auckland Poetry Slams, including Poetry Idol and Going West. He recently performed in the three-man show, The Almost Dead Poets’ Society. Time for these activities is happily compromised by his eight grandchildren, reading, cooking, gardening, ocean sailing, watching cricket and dreaming. He is a retired teacher and holds a Master’s Degree in Creative Writing. Katie Henderson’s short stories have appeared in journals, collections and been broadcast on radio. Her writing prizes include the BNZ Katherine Mansfield Novice Award, the Commonwealth Broadcasting Prize for Australasia, the Fish International Short Story Prize, and the NZ Royal Society Manhire Prize for Creative Science Writing. She is a script consultant for the screenplay, Manhunt, which is currently under development with the NZ Film Commission. Judith White is the author of two novels – The Elusive Language of Ducks and Across the Dreaming Night (Random House NZ) – and a collection of short stories, Visiting Ghosts. She is also a member of the writing collective, KK Jart, which wrote The Bitter Sweet Philosophies. Her stories have been broadcast by Radio New Zealand, and widely published in anthologies. She has been facilitating creative writing courses for over two decades. Nick Fedaeff is an award-winning artist whose work is featured in The Bitter Sweet Philosophies. His paintings are exhibited in galleries in New Zealand, Australia, Europe, Japan and The United States. Nick was born in Russia but now travels the world, returning whenever he can to Auckland. He is also an accomplished musician, composer and writer. Tyl von Randow's Shanghai childhood spanned the Japanese occupation of China, the post-war period of American rule and the Red Army's eventual triumph. His family moved to New Zealand when he was fourteen. His memoir of this dramatic time, Red Dust Over Shanghai, will be published in July 2016. A former architect, Tyl has received awards for his work in both NZ and the UK. He is also an actor and has worked in theatre and film. He lives at Bethells Beach in the Waitakare Ranges. Sue Younger has been a television documentary maker for twenty-five years. Her films have won several awards, including Best Documentary in the Film and Television Awards (Learning New Stuff) and a Media Peace Prize (Autism - Life Among Strangers). In 2014, she won the North and South short short story prize with her story, Ninja, and was a finalist in the Kobo Prize, 2014. Sue currently lives in Melbourne with her son and husband. Days are Like Grass is her debut novel. KK Jaart is a collective of writers who come and go from the group. They share a love of great literature, humour and beautiful ideas. Bittersweet Philosophies was the work of these wonderful people: Nick Fedaeff (the artist); Karen Breen; Ann Glamuzina; Stephen Leaton; Tim Heath; Katie Henderson; Judith White. Stephen Leacock was born in England and educated in Toronto, Canada. He studied at University College, Toronto, becoming a part time teacher to fund his degree. After his doctorate, he was William Dow Professor of Political Economy and chair of Economics and Political Science at McGill University. Leacock supplemented his income with short pieces of fiction and humour and for a time was the world’s most popular English speaking humourist. Franz Kafka was born in Prague (then in the Austro-Hungarian Empire.) He finished none of his novels and seems to have destroyed most of his work. He asked his friend Max Brod to destroy the rest at his death but Brod disobeyed. He worked as a lawyer in the Worker's Accident Insurance Institute for the Kingdom of Bohemia. His brilliant and unusual works are often regarded as pessimistic but are subject to widely differing interpretations. Katherine Mansfield’s short stories are universally acclaimed. Her first book, In a German Pension, was published in 1911 but her reputation was forged by two later books, Bliss and Other Stories (1920) followed by The Garden Party and Other Stories (1922). One of the first modernist writers, she died at the age of 34 after a long struggle with tuberculosis. Born in Wellington, Mansfield moved to London in 1903 to attend Queen’s College before reluctantly returning to New Zealand in 1906. Two years later she convinced her parents to let her go back. Her legacy is commemorated in NZ, the UK and France, where she lived for the final years of her life. An annual writing residency at her home in Menton, Villa Isola Bella, is available to New Zealand authors. Eunoia titles include Mansfield with Monsters (with Matt and Debbie Cowens) and The Doll's House (Leaf Editions). J L Pawley, known as Jess to her fans, is a young author from New Zealand. With a first class Master’s degree in English, a Bachelor’s degree in English and Media Studies, and a diploma in creative writing, she is a certified book nerd. Still, she always makes time to connect with her fans on social media and credits them for surviving her experimental years in self-publishing. She lives in Auckland with her partner, ‘the Captain’. V O Blum’s first three works of fiction were published in the US: Equator (regarding an expatriate sexual triangle in West Africa plumbing New Age metaphysics), Sunbelt Stories (a collection of novelettes, including sociocultural analysis by a humpback whale), and Split Creek (regarding a WW2 romance in the Rocky Mountains between the son of a Communist saboteuse in Berlin and the daughter of a Nazi saboteur in Wyoming). Although none of these stories made Blum rich, Equator was optioned for film in Hollywood (though never produced), and the flagship tale of Sunbelt was lauded by America’s leading literary critic, Gordon Lish. Here in New Zealand, DownMind received a favourable review in the Listener (22 Feb. ’14) and landed Blum summer residencies at the University of Auckland and Canterbury respectively. Chard Andrews, is a merchant navy captain and author. He has travelled the world since earning a scholarship as a marine cadet at age 17; backpacking in Africa for three months in between working on container vessels, cement ships, and charter boats. He is currently working on supply vessels in the offshore industry. It was while he was working as a mate on a ship tending the oil rigs off the coast of Australia that he had the idea for Orion Rising; a nautical thriller set on similar vessels in an overcrowded dystopian future. Chard was awarded his first command a week before his 30th birthday, and remains one of the youngest masters in the international company’s fleet. He is currently working on the sequel to Orion Rising, Polaris Burning. Fredrik is a Swedish writer who has lived in Dunedin since 2009. In July 2013 his first English novel, The Prince of Soul and The Lighthouse, won the 2013 Sir Julius Vogel Award for Best Youth Novel. His previous books include a children's sci-fi thriller (The Hunt for the Energy Gizmo, 2006) and a young adult pop novel, (Yoga for Rockstars, 2008) both of which were published in Swedish. His works have been translated into several languages. This formidable husband and wife duo pieced together recently recovered fragments of Katherine Mansfield's work, recreating beloved tales as they were first written, complete with vampires, ghouls, and alien monsters in Mansfield with Monsters. The collaboration was hugely successful, earning them the 2013 Sir Julius Vogel Award for best new talent. Their book won the 2013 Sir Julius Vogel Award for best collected work and was named one of the New Zealand Listener’s 100 best books of 2012. They live on the Kapiti Coast where they continue to write and teach. 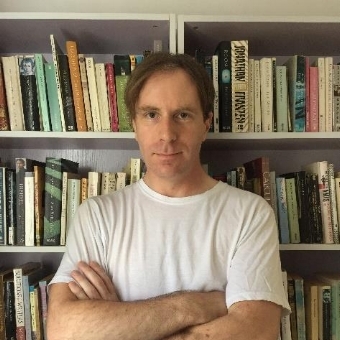 Michael Morrissey is known as an inventive writer of poetry, short stories and novellas. Since his first collection of poems was released in 1978, he has published several volumes of poetry, receiving notable awards for his work. His first collection of short stories won the 1982 PEN Award for Best First Book of Fiction. He has also edited key anthologies, written novellas, and written for the stage, radio and film. Joseph Edward Ryan’s critically acclaimed debut novel The Factory World (2103) was followed by The Glass Projector (2014), the first book in his Witches of Autumn series for nine to twelve year olds. The Amber Fountain, the second in the series, was released in 2015. Joseph Edward Ryan is also an award-winning author of short fiction and has an MA in creative writing. Summer Wigmore was born in Hamilton and now lives in Wellington. Her debut novel, The Wind City, was Shortlisted for the 2014 Sir Julius Vogel Award for best novel, a considerable achievement given that she was only 20 when it was published. Her depiction of a Wellington complete with its parallel world of Maori spirits (iwi atua) drew widespread praise. Inspiration for the book came while sitting on a bus, imagining unseen eyes in the shadows and crevices of the city. She loves urban fantasy and weaving fairy tale elements into contemporary fiction. Paul Gilbert (Ngai Tahu, pakeha) was shortlisted for the 2015 Sir Julius Vogel Award for best new talent and has twice placed Highly Commended in the biannual Pikihuia Awards for Maori Writers (Huia's Short Story Collections 7 and 8). His debut novel - a fantasy/modern folk tale, The Sovereign Hand, was published in 2014. He has an Honours Degree in Political Science from Victoria University, with further majors in Anthropology and English Literature, and a Graduate Diploma in Primary Teaching. Cao Wenxuan won the Hans Christian Andersen Award - often referred to as 'the Nobel Prize of children's literature' - in 2016. The International Board on Books for Young People’s jury noted Cao writes beautifully about the complex lives of children facing great challenges. He is a deeply committed writer, whose own difficult childhood has been deeply influential on his writing, in which there are no easy answers. A professor at Peking University and a member of the Chinese Writers Association’s national committee, Cao has penned over fifty titles and is one of China’s most important and original children’s authors. His stories have been translated into many languages. Cao Wenxuan’s numerous accolades include the Chinese Government Award for Publishing (2013), and two Outstanding Book Awards from China’s General Administration of Press and Publication. Writer, translator and president of the Overseas Chinese Literature and Art Association of Japan, Tang Yaming was born in Beijing in 1953. He travelled to Japan in 1983, where he studied at Waseda University and the University of Tokyo. For over thirty years, he worked as picture book editor at Fukuinkan Shoten Publishers, Japan’s most influential publisher of children’s books. A director of the Association of Chinese Professors in Japan, Tang Yaming has taught at numerous universities andintroduced Chinese literature to many Japanese readers. Renowned pencil artist Susumu Kinoshita is a professor at Kanazawa University. He lectures at the University of Tokyo’s School of Engineering, Musashino Art University, and Nigata University of Pharmacy and Applied Life Science. He has held exhibitions in Paris, New York, and all over Japan, and his pictures are displayed in numerous art galleries. The old and infirm feature prominently in his work, his precise etching of their faces making his subjects almost tangible. Yu Rong is a British Chinese artist and graduate of the Royal College of Art. In her work, she aims to portray Chinese culture to a western audience. Much of her inspiration stems from observing scenes of daily life in Europe and from happy memories of her early life in China. Her awards include The Quentin Blake Award for Narrative Illustration (1999), The Folio Society Illustration Awards (1999), and the Sheila Robinson Drawing Prize (2000). Her illustrations for The Cloud-like Myna won a Golden Apple award at the 24th Biennial of Illustration Bratislava, and a Golden Pinwheel at the 2013 Shanghai International Book Fair. Yu Rong lives in rural Cambridgeshire with her husband, Donkey, and her three children. Duncan Poupard developed a fascination with China while studying for a history degree at the University of York. For ten years, he immersed himself in the study of China and its languages, obtaining an MA in Sinology from the School of African and Oriental Studies in London. He has travelled widely throughout China, working as a translator and news correspondent. Duncan lives in Hong Kong, where he teaches Chinese-English translation at the Chinese University of Hong Kong. He is studying for a PhD in Translation. Yan Ding, also known as Lydia, is working with Eunoia Publishing Group on a number of new titles. She gained her PhD in Translation Studies from the University of Auckland after completing both a BA in English and an MA in Applied Linguistics at Dalian University of Technology, China. Her translations have been published by Beijing University Press and Chongqing University Press, including “Female Writers in Ming and Ching Dynasty”, “Introduction to Nietzsche” and “Introduction to the Birth of Tragedy”. Lydia believes that translation bridges the gaps between different cultures, allowing readers to comprehend each other’s perspectives on life and living. For every work of translation, Lydia’s aim is to achieve a beautiful and faithful rendition. Paul is a writer, poet and professional communicator based in Auckland, New Zealand. His journalism has appeared in many metropolitan and provincial New Zealand newspapers. His fiction has been broadcast on National Radio and published in the New Zealand Herald newspaper and “Caress”, a feminist ‘zine. Paul studied journalism at the Auckland Technical Institute (now the Auckland University of Technology) and fiction writing at Owen Marshall’s Polytechnic programme. The educational works range from entry level readers to upper primary texts, with several chapter books at this higher level. Her work includes a variety of non-fiction at all levels, including readers with Science and Math focus. Kim Goldwater was born on Auckland’s North Shore in 1937. He studied Engineering at Auckland University and graduated with a Batchelor’s degree in Civil Engineering. He and his wife, Jeanette, travelled overseas where he worked as a Civil Engineer, spending three years in London and two years in Spain, before returning to New Zealand. Their time in Spain gave them a love of fine wine and the understanding that New Zealand could also produce wine of a similar high quality. This led them to establish a pioneer vineyard on Waiheke Island. Their success in this venture encouraged them to expandproduction into Marlborough and later Hawkes Bay, to become one of the largest and most prestigious wine producers in New Zealand. Joan Norlev Taylor is a New Zealander of Anglo-Danish heritage currently living in Wivenhow, England. Her writing has been published in the UK, USA, Australia and NZ. Her published fictional work is Conversations with Mr Prain, 2006 & 2011 and kissing Bowie, 2013. Julie has been writing for many years. She her first novel The Discombobulated Life of Summer Rain was published by Makaro Press in 2016. It was shortlited for the Tom Fitzgibbon Award. In between drafts of Summer Rain, she wrote four more novels, including House of Spirits. House of Spirits is based on the childhood home and valley where she grew up in New Zealand. Julie now lives in Melbourne. Christine Leunens is the author of three novels –Primordial Soup, Caging Skies (nominated for the Prix Médicis) and A Can of Sunshine (NZ Herald’s Best Books of the Year 2013), which have been translated into ten languages. The world premiere of the play adaptation of Caging Skies, written by Desiree Gezentsvey, will be performing at the Circa Theatre from 12 August to 9 September 2017 and a film adaptation by Taika Waititi, is to be filmed 2018-2019. At present Christine is writing a fourth novel, a Franco-New Zealand historical one. Florence Kiss is a French author. The Seed is the first and only English edition of Florence Kiss’s prize-winning French novel “Les naufragés du néant”. She lived most of her life in other countries.“The Seed” is the symbolic outcome of this experience. Now back in France she travels figuratively through art: music, painting and writing. Latesha (Tesh) Randall is based in the peaceful seaside surf town of Raglan, NZ with her partner Seb. Together they enjoy writing, bee-keeping, off-the-grid building (projects include a yurt and a tiny house), gardening, surfing, alongside running their fast-growing coconut yoghurt brand (Raglan Coconut Yoghurt). As a youngster, Tesh volunteered at her local library for years and relished being surrounded by books! Her love of words has lead to publishing several children's books with Eunoia Publishing, and a personal development book, The To-Be List, with Blue Mountain Arts in the United States. She is also the Editor of Arrival travel magazine and freelances for many other magazines. AT McIting is a mystery. Due to the nature of the subject matter of her writing, she wishes to remain so.